garbage – has to be separated into piles of plastic, paper, glass, and food (all wasted food needs to be put in its own pile). masks – people wear those doctor masks when they’re sick. It’s kind of scary actually because it looks like there might be a plague-outbreak or something, but really, sick Koreans just don’t want to get anyone else sick…so I guess it’s nice. It’s ridiculously hard to understand people though when I can’t see their mouth! rice cooker – everyone has one. I eat rice every day! You have to wash the rice here a little before you cook it—that’s why it’s so yummy is what someone told me. 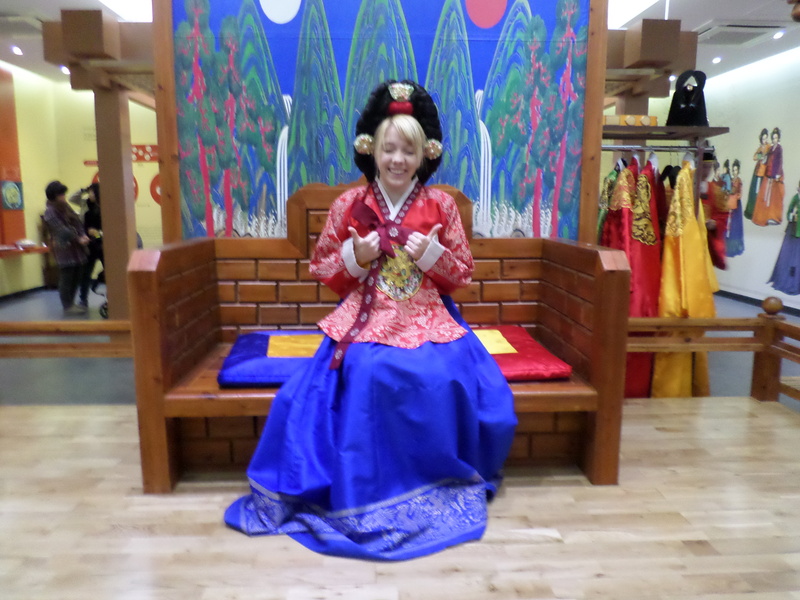 We got to go to the Seoul temple this week! It was beautiful. It’s crazy because you really can be a block away from it and not be able to see it. I love how they keep up the grounds. They’re gorgeous! It was such a beautiful day when we went there, too. Perfect! Agh! I feel so bad that my nametag is off; I took it off for the temple and it was in my backpack. I love it so much! 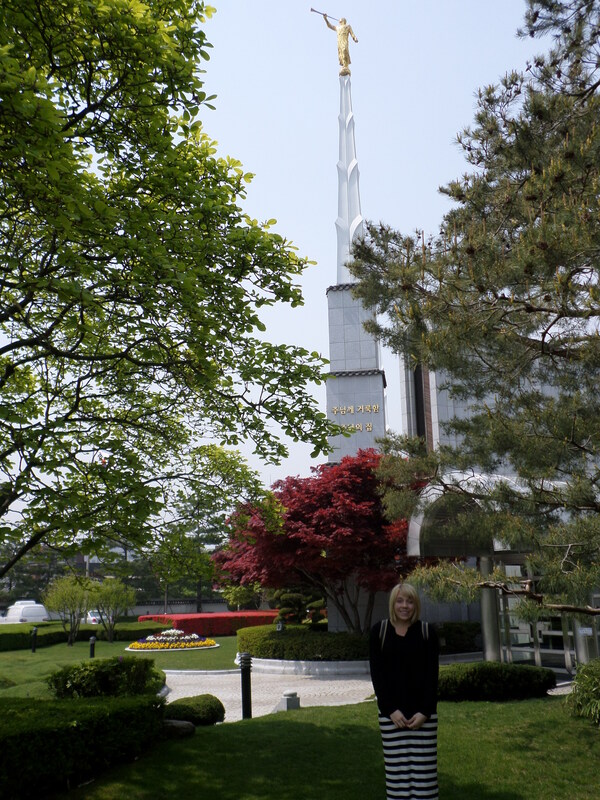 I think I say that a lot, but oh my goodness there are just so many things I love about the Gospel, and Korea, and missionary work that I can’t help it. I still don’t really know the word for hate in Korean because I just don’t use it, ever. Story for the week is about Family History Missionary Work. Woohh! Sounds super boring right? Wrong! We really wanted to start using family history work to get to know people so we asked a member about his family this week and we learned that most Koreans have a written genealogical record. The member we met with was from China, and he was so excited to show a bunch of foreigners his history. He even had ancient scrolls from Kings that mentioned some of his ancestors on them! We asked him after he had shared with us his family records what some of his ideas were for how we could better use family history work in our missionary work, but we must have asked him how he can do missionary work for his family because he started talking about those who had no religion in his family and how he would be a better missionary to them. Well neato! If we help motivate members in any way to do missionary work than we are successful! As a missionary, the members who find people for us to teach help the most. If my mission has done anything for me, it’s made me realize I want to be a better member missionary when I get back. This is probably one of the hardest things I’ve had to learn to do. It’s scary talking to random people, but it’s something we must do. Just talk to people because you love them and believe that God loves them even more! Most of the time, people are courteous enough to carry on a conversation if you start it. So this woman in our ward talks to everyone, everywhere she goes. She just gets to know about them and their family. From this, she met a woman who’s daughter is going to BYU (and who isn’t LDS). She shared with her that she is LDS, too, and established a friendship that let this lady know she loved her for who she was, but she told her that she would love if she met the missionaries. We were invited to this lunch that was really chill and relaxed and friendly and got to know a little more about this lady. At the end, the member asked her friend if she wanted to do more with us and she said yes. And then, (I don’t know how things work in Korea, but this woman was so bold) she told her frankly that she was going to be an investigator of our church, and that she would have to search and do the work required to really know if our church was true. Then she started teaching her friend how the Gospel blesses families. It was amazing! She was the missionary and we were just there to bear another testimony and witness that what she was saying was true. That’s how I want missionary work to be always. When we met with our new investigator to teach the first lesson, she was ready to receive it. It was amazing! Pics of the flowers because I love them so much! Old pic, Easter egg hunt with the primary and this cutey! The streets are just full of color right now! 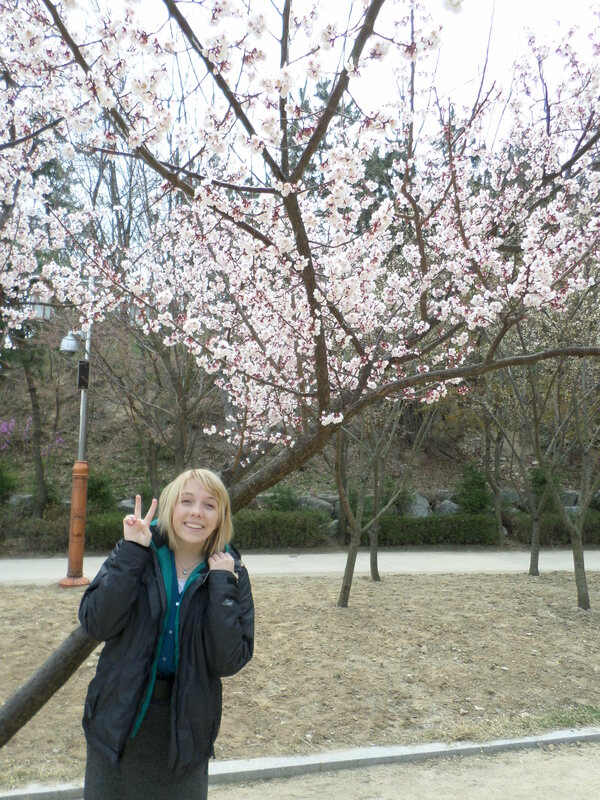 Me in front of the pretty Korean flowers! Have a good week. Hoorah for Israel! I’ve been hearing all week about the ferry. There is a school in our area with a bunch of young kids that were on it, and everyone is in mourning. It’s really sad. But this video brings so much hope. Have I told you that I’ve been to a Korean funeral? It was a couple weeks ago. A new member in our ward’s mom passed away and we came to support him. It was very different. It started the day she died, and it lasts for 3 days. From what I understood of it, there’s a mourning room and then a happy room where everyone is fed and just hangs out. We were in the happy room most of the time. They fed us flattened pig head meat, and it is the grossest thing I have eaten yet. Anyway, it meant a lot to the man because he loves the missionaries and it was an interesting experience to have for sure. So funny story about Easter in Korea. It’s actually called Jesus Christ’s Resurrection, or Resurrection day. That’s what it literally translates to. When I heard that, I was just like, Thank you, Heavenly Father, for making my life so easy! So all of Easter Sunday we went around and asked people if they wanted to come to Church because it was Jesus Christ’s Resurrection day. Everyone was really nice, but no one had time to make it. We had a bunch of wonderful conversations from it though. At church they fed us boiled eggs and it was pretty awesome. I’m understanding a little more in Church now than I did my first week here. I can understand a few words here and there and try to piece it together so I at least know what the topic is they are speaking about. Slowly I will get to where I can understand everything. Last week I told you about our sweet investigator from China who had dropped us. We felt prompted to visit her out of the blue this week and share the story of Esther with her. We told her that just like with Esther and the King, the hearts of her husband and mother-in-law could be softened if she had the courage and faith in God. She told us that she didn’t believe God could soften their hearts, but she still loved us and would let us meet with her every now and then. She had given a really generous donation to the church because she loves it so much. It was a testimony to me that all of our efforts did mean something to her, and that the Holy Ghost had touched her heart. Even though she doesn’t believe that the hearts of her husband and mother-in-law can be softened, we believe. We love her so much! 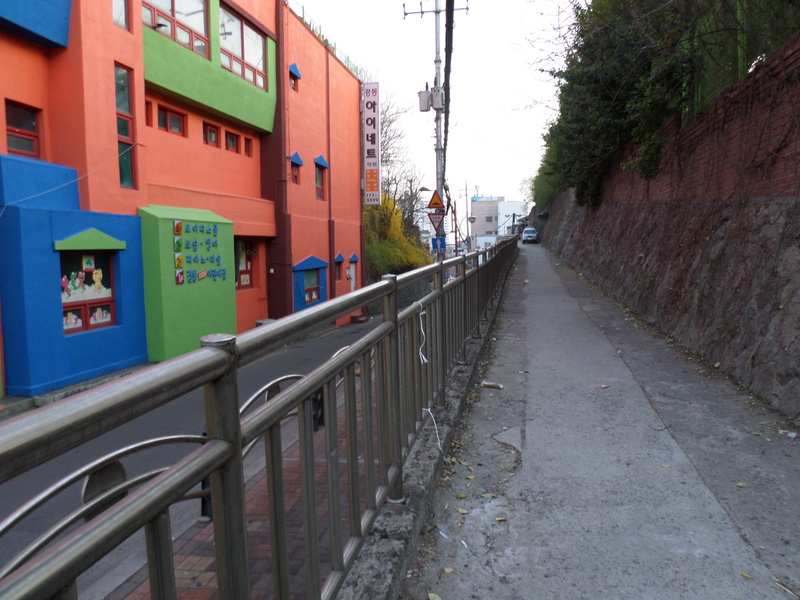 Sometimes I feel really inadequate here in Korea, but I never feel incapable because I have God. Sorry no new pictures this week! I only have time to email. 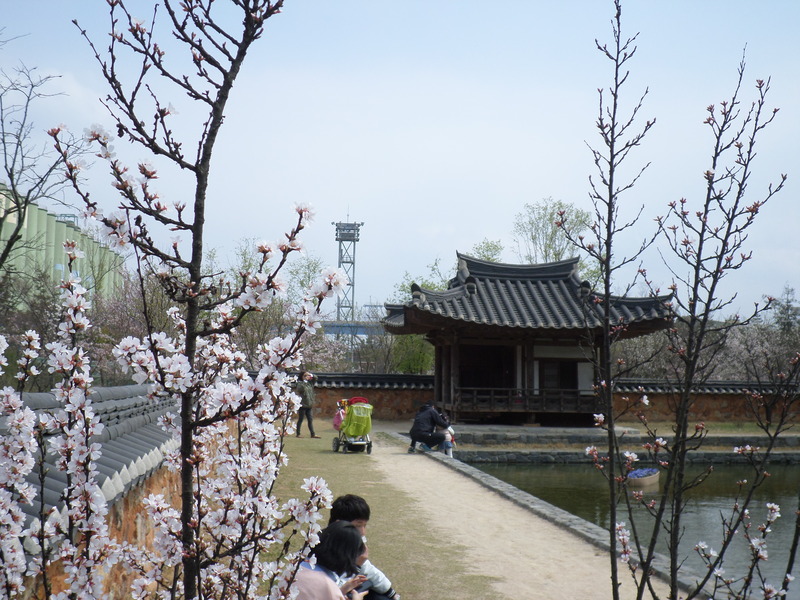 We’re going to the Seoul Temple on Thursday, so that will be our P-day. This week has been full of ups and downs. We had lots of good things happen, but we also had a lot of pretty devastating things happen. Learning Korean is going okay. It’s getting a little easier to understand the jist of things, but it’s still really difficult. The hard thing about Korean is there’s a couple hundred ways it seems to say the EXACT same thing depending on who you talk to. In the MTC, they taught us high form, which is used in Church and when teaching lessons or when talking to old people, but that’s pretty much it. Most people speak in middle form casually, so I’ve been learning that. It’s a little easier to learn though now that I know high form. There’s also low form which is easy, but you only use it when talking to children or animals, or in writing. This week I actually learned a form higher than King form from a Korean missionary. I used it to thank members for a meal and they thought it was so funny. It would be the equivalent of a missionary saying: “Thank you a lot, your emperor/majesty!” I plan on using it more now, haha. 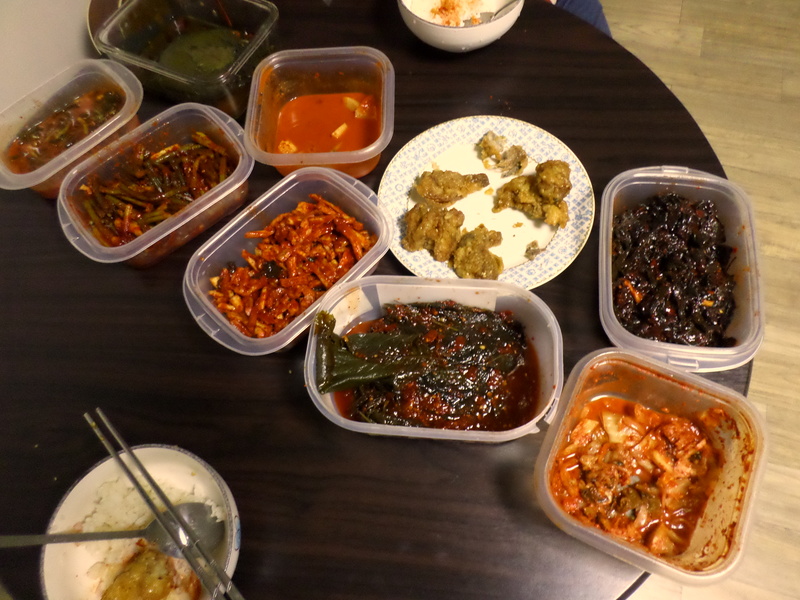 Something fun is that I made Kimchi for the first time with a new investigator a member referred us to. It was great. 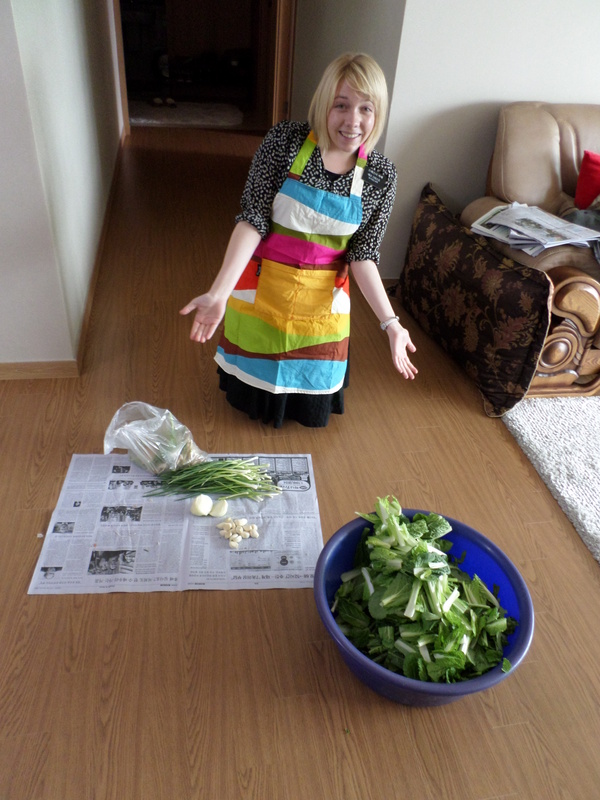 We thought that we were making the Kimchi for her for service, but at the end, she wanted us to take it. So now it’s fermenting in our apartment because that’s just what you do with Kimchi. Yum! She also gave us these really neat traditional Korean fans that her 80-year old grandma designed. It was so nice! I felt bad because I didn’t want to take such a nice thing, but it would be rude and insulting not to. She liked us a lot and wanted to give us a bunch of nice things. Korean people are really giving. As missionaries, we actually take a lot of care to never look too closely or take too much interest in any item in people’s houses because they would probably give it to us if they thought we liked it, even if they didn’t have the means to do so. Even though there’s been a lot of fun good things that happened this week, we faced a lot of rejection and that’s been really tough. Even though the majority of Koreans are very kind, just as in any place, there are people that can be rude and mean to you just because you’re a missionary for the Church of Jesus Christ of Latter-day Saints. I think the thing that broke my heart the most this week was when one of our investigators from China told us she didn’t think it was good to meet with us any more for lessons. Even though she loves everything she knows about our church and the Gospel of Jesus Christ, her mother-in-law and husband are against her going to meet with us, and she decided to respect their wishes. She even had a baptismal date, but she doesn’t believe it’s possible anymore. I cried when she left because it broke my heart. I think that’s the first time I’ve cried since in Korea (not counting the times when spiciness of food has made me cry). She told us that she’s still going to read the Book of Mormon because she likes it a lot. We’re not actually giving up on her. She has such a love for the Gospel and so much faith that she acts on, that we still believe things can work out. We’re not sure what to do next, but we’re praying…and we know Heavenly Father’s going to help prepare a way. General Conference was really great! We watched all the sessions in the cramped clerk’s office in our church and it was fantastic! How often will I get the chance to be squished in a tiny church room so I can hear the prophets speak in English, while upstairs everyone’s watching in Korean. It really picked up our Spirits and built our hope after our investigator told us she didn’t think she could be taught anymore. I loved Elder Holland’s talk. He is such a powerful speaker! I want to be as bold and brilliant as him when I teach and talk to people. You can tell he is a man of God. Everyone that spoke was amazing and definitely spoke the word of God. I love it. Even though Korea is super modern with some things, other things are a little..um..interesting. In lots of the public bathrooms you have an option to use a normal toilet, or what I like to call “the squatter.” It’s pretty much what it sounds like. A toilet in the floor that you just squat and go, I guess. It’s umm…I’m not going to talk about it any more. But while I’m on the subject, I’ve never used such low-tech and high-tech toilets before I came to Asia. There are some toilets that are so high tech that they play songs when you’re on them. There are so many buttons on them too. It’s hard sometimes to find the flush button! I just want to let ya’ll know that I’m going to be a really interesting person when I get back…like in a weird way. I’m going to bow when I say hello to anyone. I’m going to feel weird if I have to shake any guy’s hand (girls and guys don’t shake hands in Korea because it’s almost like flirting- we just do a small bow to them at church). I’m going to ask weird things like “How does your name become?” or “How does you phone number become?” because that makes a lot of sense in Korean. I’m going to get really excited over stickers and making things cute (you should see the planners of the missionaries in our mission–even the Elders decorate their planners because hey! It rocks). It will probably take me a while to say “bless you” again when someone sneezes, or “I’m sorry” if I run into someone a little. I’m going to want everything to be really spicy and hot, and I probably won’t want water with a meal because that’s how Koreans do it. 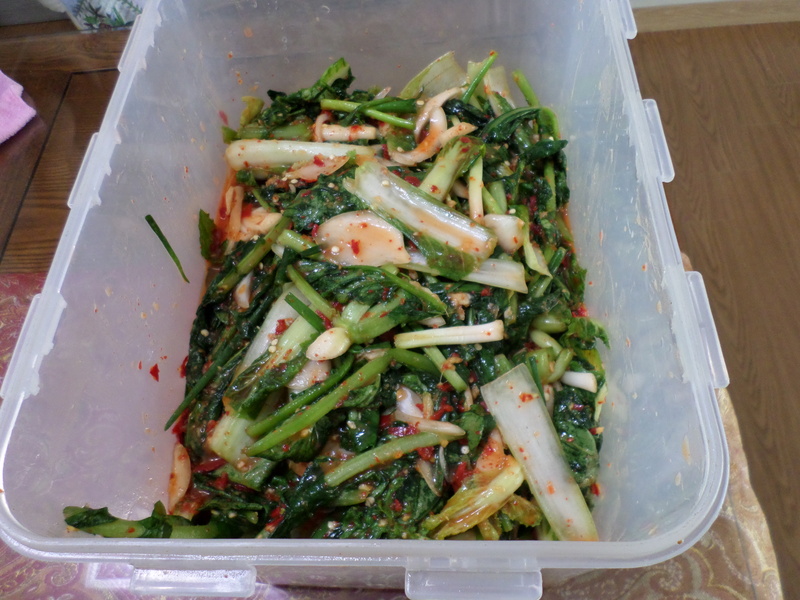 And I’m going to know how to be a good Kimchi-making woman, which is the best of all these things because who doesn’t want a woman who can make a spicy fermented dish out of any vegetable? C’mon, really. It’s awesome! Actually, Kimchi is really growing on me. Cucumber and radish kimchi are my favorite. Also rice. I eat rice every day and it’s become a staple in my life. Take care this week! Bye! This week was really fantastic! The Cherry trees have bloomed! I never thought I had a favorite tree, but I love cherry blossoms so much. They make the streets looks like Heaven because they are so white and they smell so good. I love them! I have a quick story to share with you this week on listening to the Spirit. So we were walking home one night when we passed this girl walking the other direction. I said “Hi” to her, and she smiled and we kept on walking. As we were walking, though, I got this big feeling that I needed to go back to her- but I felt like that would be super creepy if I did. It would be so easy to keep on walking because Sister H was busy on the phone, but I felt like I needed to go back to her. So I turned around, and literally ran until I caught up with her, then I think I yelled, “Where are you going?” (because it’s one of the few phrases I know how to say in Korea). She said something that I couldn’t understand and pointed, and I smiled and nodded like I understood and said, “Great.” Then I just stood there and I couldn’t think of anything to say. My mouth was open but I didn’t have anything to say. Sister H came up and said that we were missionaries, asked a question, then said goodnight and that was it. As we were walking home after that I thought about why I had felt such a strong prompting to talk to someone without really receiving the ability to do so. I didn’t feel weird about what I did at all, which is interesting because usually I would feel a little creepy running back to a random person and yelling a question at them…but I felt good. I just felt this big love for the girl that just jumped out of me. I think the purpose of me being prompted to go back to her was for the Lord to see if I was willing to listen to the promptings of the Spirit and put my faith before my fears. Even though nothing really seemed to happen from it (we didn’t even get her name or give her a card argh!) I think we made her happier that night. I think my faith has grown a lot from that simple experience. I keep on thinking back to the story of Moses in Exodus, and how he is “slow of speech, and of a slow tongue,” but the Lord provides a way for him to accomplish what he has commanded still. In Moses’ case it was Aaron, his interpreter; and in mine I think it is Sister H, my trainer. When the understanding and words I want to say just don’t come, Sister H is there to make sure that the Lord’s work still gets done. I know God put her into my life for a reason, and I’m so thankful for it! Babies in our ward! Seriously the cutest things ever! This girl mimicked Sis H while on the phone. So funny. Our investigator’s baby! Seriously the cutest thing ever! I love Korean babies! She was really grumpy, but when I pulled out my camera to take pictures of her she just lit up! Ward Members dressed up in traditional wear. If you notice our investigators baby is crying in the corner awh! We went to a place in China town with a member and her friend who she’s wanting to introduce the Gospel too. We had dinner inside this place then took some pictures outside haha. It went really good! Member missionary work always seems to be the most successful. We’re going to meet with her this week to start teaching the lessons! I love Korea so much and I love missionary work even more! It’s so cool! Everyday we have so many miracles. It’s the best!